Montvale, NJ (May 1, 2012)--- A mother of a child with multiple food allergies was frustrated by the lack of allergy-related kid-friendly products so she took action and created AllerMates®, a new line of bright, fun, whimsical character-driven wristbands, dog tags and lunch boxes that her son would happily embrace. Parents of children with allergies can now enjoy the safety and security of knowing their young ones are better protected against unwanted allergens when they wear or use AllerMates products away from home in places like school, daycare, parties, sleep-overs and summer camp. AllerMates arrive in time for Food Allergy Awareness Week, May 13-19 and for camp and summer travel. 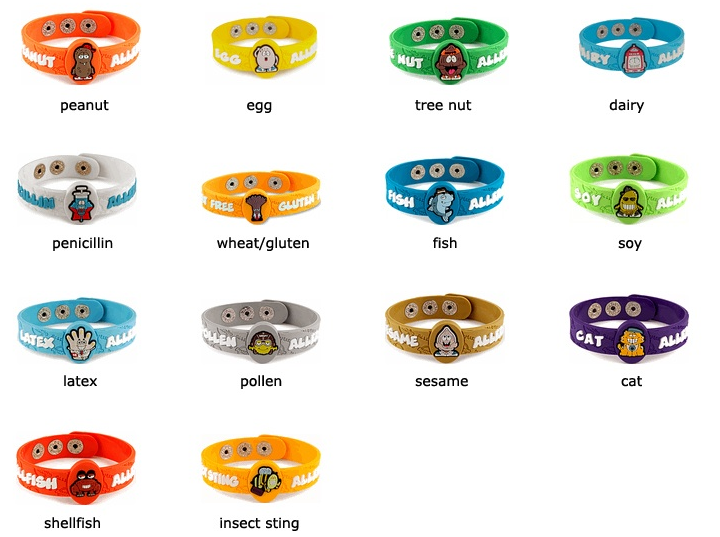 AllerMates products are based on 14 fun, original characters that represent the most common allergies: peanut, nut, gluten/wheat, milk, egg, shellfish, penicillin, insect sting, latex, pollen, fish, soy, sesame and cat. The characters and product line was created by Iris Shamus, Founder and CEO of AllerMates, in part to help kids feel positive about their allergies. No matter how many forms I signed or how many times I spoke to the teacher the inevitable happened” states Iris Shamus, AllerMates Founder. “My son and another allergic classmate were offered food they weren’t supposed to have. It didn’t go well. So, I set out to create something more personalized so that a teacher or caregiver would always be aware of his allergies,” continues Shamus. “AllerMates wristbands gave me a sense of comfort and security I couldn’t have without them." Giveaway will end June 20th at midnight EST. This giveaway is sponsored by AllerMates. No compensation was received. All opinions are my own. This promotion is in no way sponsored, endorsed or administered by, or associated with, Facebook. We hereby release Facebook of any liability. Winner(s) will be contacted by email 48 hours after the giveaway ends. If you have any additional questions - feel free to send us an email!